Still stung by a recent 4-0 thumping of the United States national team by Costa Rica in 2018 World Cup qualifying, this write-up comes painfully. I traveled down to San José, Costa Rica with the American Outlaws, still dejected from the election but wanting a reason to like this country. Our football (not of the American variety) team is made up of dual nationals and sons of immigrants from Colombia, Mexico, Germany, Iceland, Norway, Sierra Leone, Liberia, Haiti, and Japan, amongst others. The current leading scorer of the team is from deep in the heart of Texas. The captain is from Princeton, New Jersey. But after beating Costa Rica 4-0 over the summer in Copa America, the Central Americans returned the favor with the same score in their home. Their fans were relentless to our relatively small group of vocal supporters. The hate between the two teams goes back quite a ways, and this was their turn to be jerks. I could not think of a better way of getting over it than by eating, and Olga's Place is ground zero of Tico football support in New Jersey, if not the east coast. 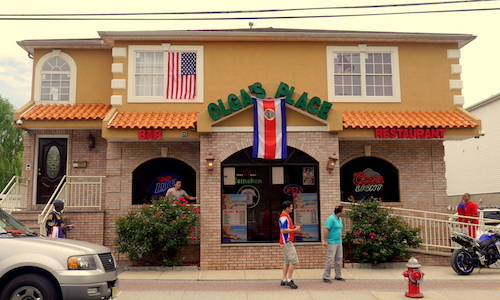 My first meal and experience here came during the World Cup in 2014 when the country shocked the world and won their group ahead of England, Italy, and Uruguay. The place was packed, loud, and full of energy. The return trip at the end of 2016 was on a lazy weekday lunch, a time better for enjoying the food. Olga's is on a sleepy street south of the interstate, cut off from the main streets of Elizabeth. It is located in a former private residence and is set up in two parts, a long bar along one side of the restaurant, and dining tables on the other. 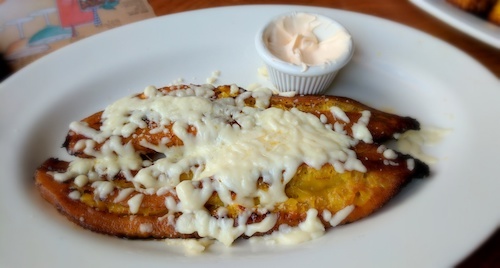 Knowing the casado plates are enormous, we decided on a couple appetizers and one main, first trying the platano con queso ($5, above), a plantain sliced open and covered with salty cheese. 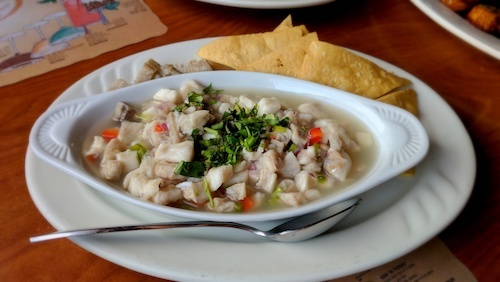 We also had our eyes on the ceviche de pescado ($12, below), which comes with a few tortilla chips. We squeezed in some extra lime as well. 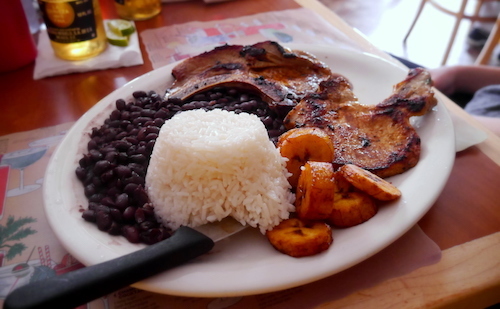 From my first visit here during the World Cup, the casado de chuleta ($15, below), is a thin pork chop seasoned very well. 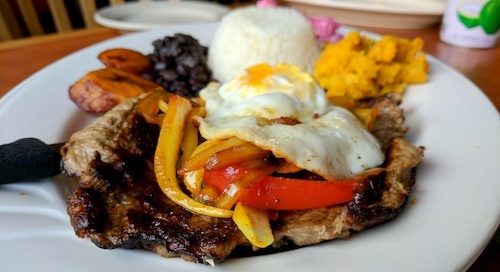 A casado translates to "married man" and is used to signify a full meal including beans, rice, and plantains. On the return visit, the casado seemed to grow with a potato and beet salad as well as another spicy potato side. 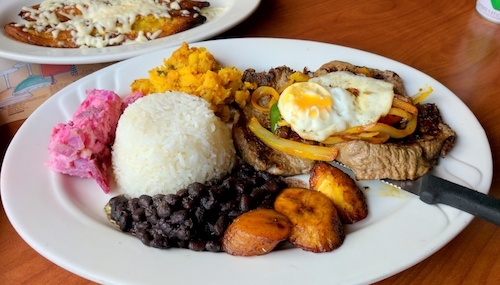 Our casado con bistec encebollado ($15, below) even came with an egg on top of the steak. Once again the meat is well marinated, and the rice and beans are on point. The meal and two appetizers strategy worked well, both of our bellies were maxed out for this lunch. 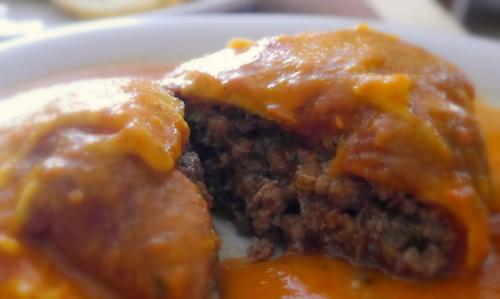 Back on gameday 2014, the chile relleno de carne ($13, below) was the perfect match snack. 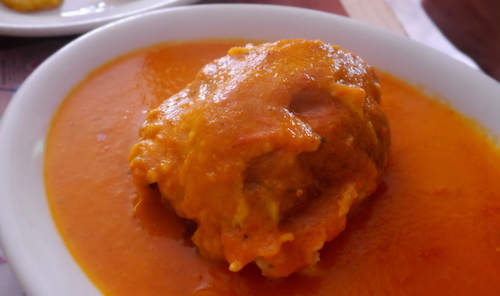 The stuffed chili pepper is covered in savory sauce and is served with rice and salad. Opening up the pepper shows a stuffing of seasoned ground beef and nothing else. I distinctly remember this plate being vacuumed of every morsel it was so good. While mildly cathartic, the trip to Olga's did not do all I wanted to tame the anger I was feeling towards Tico football supporters, but being surrounded by the lovely people here was a good reminder that these parts of life have to be separated. 2017 brings two chances for us to exact our revenge on home soil, and I will be there to rub it in at the stadium when it happens, and buy those poor Ticos some beers. The next set of qualifiers for the Ticos are in late March, so make plans to come to Olga's in Elizabeth and catch the great atmosphere.